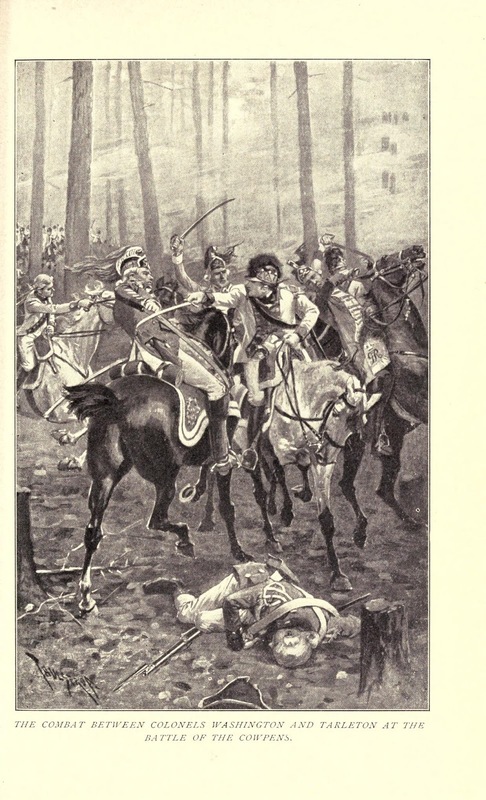 On January 17, 1781, at the Battle of the Cowpens, British Colonel Banastre Tarleton was decisively defeated by Continental General Daniel Morgan. Tarleton’s British regiments gained ground until they were confronted with an unexpected counterattack and disintegrated. Now the American troops were pushing across the battlefield, capturing surrendering British soldiers and fighting artillerymen who were defending their cannon. The artillery and baggage was in danger, and Tarleton was determined not to let the enemy get it. He was, after all, a cavalryman who excelled in headlong charges against numerically superior enemies. Tarleton, who was escorted by two other British officers, slashed at Washington. Raising his saber, Washington deflected the first slash. Tarleton cut again at the Continental colonel and the blade of Washington’s saber snapped off, leaving him holding only the hilt. To add to Washington’s danger, Cornet Patterson (2) of the 17th Light Dragoons had ridden around the duo and was prepared to attack Washington. But Washington’s 14-year-old trumpeter and orderly named Gillie (3) drew a pistol and shot Cornet Patterson. While this was happening, another British officer made a slash at Washington. But Sergeant-Major Perry (3) blocked it and wounded the British officer with his own sword. Meanwhile, Tarleton had drawn his pistol from its holster and fired it at Washington. The shot missed Washington but wounded his horse. With this, the three British officers rode away. Tarleton could thus claim the distinction of firing the last shot of the Battle of Cowpens. It was small comfort for a man who had lost 1,100 of Cornwallis’ elite light troops. This loss would be evident nine months later at a small port named Yorktown. (2) Cornet Thomas Patterson of the regiment was killed on this occasion*, and Lieutenant Henry Nettles wounded; several private soldiers and troop horses were also killed and wounded.